Status: Paired with Gerald. 2015: Nest built (thought to be Gerald/Flash pair) but failed 2016: Made 2 nesting attempts, both failed. 2017: One nesting attempt – failed at egg stage. 2018: One successful nesting attempt, one chick reared to fledging stage. May 2011: Flash has been nicknamed on account of his rather crazy and uncontrolled habit of tearing about within his coop. 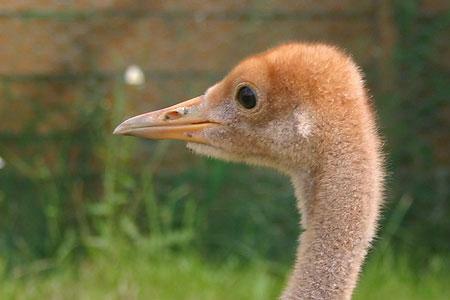 She has slightly wonky toes, and is the second youngest of all this year's cranes. She is the sibling of Gerald. 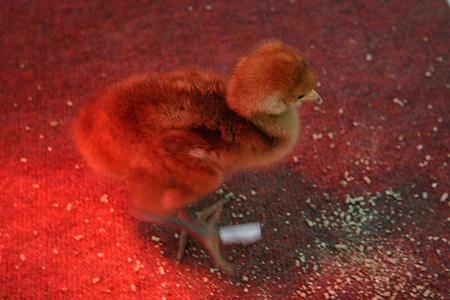 June 2011: Flash is having some leg growth problems at the moment - and appears to walk very flat/heavy footed. We are keeping a very close eye on her development. September 2011: Flash is doing well and has become a very good flyer, but she has developed quite a bad limp, we think as a result of landing heavily. However, this doesn't seem to deter her from foraging and mixing with the other birds. October 2011: Flash's limp seems to have virtually disappeared she is now flying with much greater control. 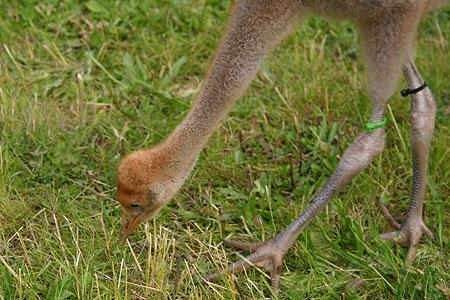 September 2012: Flash has adapted well to life with the Somerset flock and she and her cohort are all behaving as naturally as any wild cranes. They have spent the summer feeding on the un-seasonally flooded grasslands of the Moors and Levels in small fragmented groups, but as autumn rolls in they are starting to flock again and follow the harvest, hoovering up any spilt grain in the fields. January 2014: 2013 was quite uneventful for Flash, spending the spring and summer on Aller moor and West Sedgemoor, the autumn feeding in and around the Stoke St. Gregory Ridge and Stanmoor and the winter flood period on Stanmoor pasture, pulling up worms as part of a large flock. July 2015: Flash formed a strong pair bond with Gerald, her sibling, during the spring of 2014 – and then went missing for much of the summer of 2014, and it is thought likely that they were probably moulting. At the release of the final batch of young birds in the autumn of 2014 however – Flash, along with Gerald seemed to almost ‘adopt’ a small group of the young birds ho followed them around everywhere. Perhaps they were practising at being parents! In spring 2015, Flash, along with Gerald both became a little elusive, and we are fairly certain that they are the pair of birds that built a nest on West Sedgemoor in a naturally very wet, low-lying and well vegetated area. However – this could not be confirmed and the outcome was unsuccessful. February 2016: Flash spent the rest of the year on the Somerset Levels and Moors. In early January she was recorded as being a clear pair with Gerald - but not yet occupying a territory. July 16 Established territory on the north eastern side West Sedgemoor in late January and started nesting activity in late March. 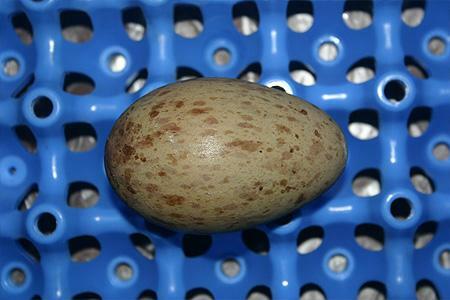 The 1 st incubation started in 23 rd April but failed after about 16 days possibly predated by a crow or an otter. The 2 nd incubation in the same area began at the end of May but was predated after 30 days, predator unknown. Nov 17: Flash was confirmed paired with Gerald on 22nd March in the territory they held last year on West Sedgemoor. On 24 April a nest was confirmed and incubation thought to have started on 22nd/23rd April. On 9th May the nest was abandoned and no eggs were found in the nest and the cause of failure is unknown. The pair remained in their territory feeding but no further attempts at nesting were made. Flash was back with the flock in the Autumn. Sept 18: Gerald and Flash were seen together in their territory occasionally during late winter and through into the Spring Incubation began 16th April and is thought to have hatched around 16th May. Seen occasionally with their one chick in their territory but mainly well protected by vegetation. An attempt was made to capture and ring/radio tag the juvenile on 16th July – but the birds evaded the team and it fledged, unringed shortly after.